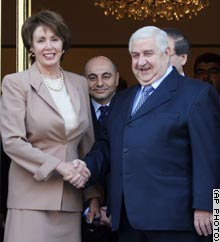 I am filled with admiration for Nancy Pelosi for having the courage and audacity to visit Syria this week. In one brilliant step she has moved from the speakership to the world stage. It was a stunning move that showed the world a better side of America than the one they have been seeing in recent years. Nancy's visit demonstrated to the world that America is not all about Bush and Cheney. After the dark, dreary, disastrous night of George Bush's ruinous presidency it is refreshing to watch the woman who is second in line to the presidency make such a bold, independent and unexpected move -- a move that is, moreover, right in the face of Bush and Cheney. Bush is, predictably, apoplectic. Mentally muddled as ever, he charges that Nancy's visit sends mixed signals to Syria and the world, not getting it that that is exactly what we want and need. Following the report of the Baker-Hamilton Commission we have watched the government dither over the desirability or lack of it of talking to Iran and Syria. Nancy says, "no problem...watch this!" She steps on the plane and goes to Damascus. There she sits down and talks to Assad. Mission accomplished! (Thanks for that, George.) As Dylan says on his last album, "things have changed." What does this tell us about Nancy Pelosi? Did anyone think she would take this kind of electrifying action so early in her term? Not I. Barely three months have elapsed since she took office and she has made herself a global political player. What nerve! What next? Taking stock, the Speaker is mature, beautiful, articulate, intelligent, imaginative and bold. Do Hillary and Barack have cause for concern? Postscript: As we watch Nancy Pelosi's ascending star, we should also take note of Germany's prime minister, Angela Merkel, who is surprising people who had sold her short with her astute and successful diplomacy. Angela has a Ph.D. in quantum chemistry and is not to be sold short.